When social psychologist Stanley Milgram invited volunteers to take part in an experiment at Yale in the summer of 1961, none of the participants could have foreseen the worldwide sensation the results would cause. Milgram reported that fully 65 percent of the volunteers had repeatedly administered electric shocks of increasing strength to a man they believed to be in severe pain, even suffering from a life-threatening heart condition, simply because an authority figure had told them to do so. Such behavior was linked to atrocities committed by ordinary people under the Nazi regime and immediately gripped the public imagination. The experiments remain a source of controversy and fascination more than fifty years later. 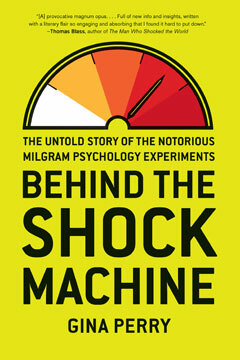 In Behind the Shock Machine, author and psychologist Gina Perry unearths for the first time the full story of these flawed experiments and their startling, long-lasting repercussions. Interviewing the original participants—many of whom remain haunted to this day about what they did—and delving deep into Milgram’s personal archive, she pieces together a more complex and much more troubling picture of these experiments than was originally presented by Milgram. Uncovering the details of the experiments leads her to question the validity of that 65 percent statistic and the claims that it revealed something essential about human nature. Fleshed out with dramatic transcripts of the tests, the book puts a human face on the unwitting people who confronted the moral test of the shock machine and offers a gripping, unforgettable tale of one man’s ambition and an experiment that defined a generation.